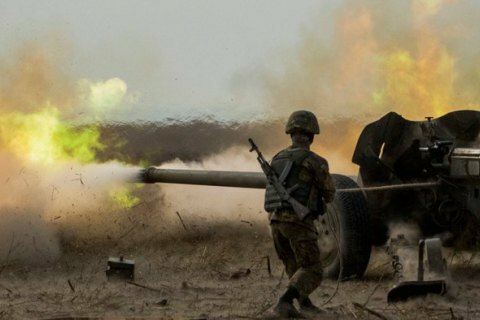 ATO forces 12 times returned fire to 22 enemy shelling attacks. Over the past day, the illegal armed groups in Donbas 22 times violated the ceasefire deal. Five Ukrainian soldiers were wounded and one was killed. In turn, the forces of the ATO on 12 occasions returned fire. An ATO trooper was killed at around 08.00 on Thursday as a result of the enemy shelling in the area of Vodyane, Donetsk Region, according to an ATO HQ report on Friday, 28 July. Two Ukrainian soldiers sustained shrapnel wounds as a result of grenade launcher fire in te area of Novotoshkivske, Luhansk Region. Another Ukrainian got wounded in a blast of an unknown explosive device in the vicinity of Krymske. The fourth ATO officer received a fragmentation wound in the firing of the ATO positions in Zaitseve, Donetsk region. The fifth fighter was wounded in the shelling of Avdiyivka. The death of a fighter on Thursday was the first since the beginning of the week. Over the past week, 12 ATO fighters were killed in Donbas: one on Friday, five on Thursday, four on Wednesday, and two more on Tuesday.